Well! I posted a package to Nicki in NZ last Thursday lunchtime and I received an email today that it had already arrived!! In all the time I have been sending to Nicki never has a parcel made to her in such a short time. 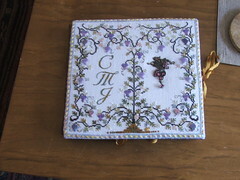 Here is the centerpiece of the package I sent – Merry Cox’s Joyous Christmas Ornament from the 1997 issue of Just Cross Stitch Christmas Ornaments. 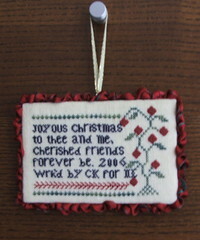 Yes, this is the mysterious ornament that I featured a week ago when I blogged about ruched ribbon finishing. As I said around about that time, I didn’t realise that the chart for the over one lettering didn’t have the correct spacing between the lines (it had 3 threads instead of the 5 on the main chart – I could have kicked myself when I realised). So this ornament has a row of feather stitches because I couldn’t face unpicking all that over one stitching. I was very pleased with how this turned out and I am glad to hear that Nicki liked it too. I also sent some stitching guff – Olde Colonial designs’ Mimi’s Tape Measure kit and Chatelaine’s Misty Morning Vineyard chart. Also a felt kangaroo ornament which I love – I may have to go back to the store and see if I can find another for our tree. If you haven’t already been over to Nicki’s blog Plush – go on over – she has much better pix. Here it is!! La la la!! Ok, I still haven’t decided about the tassel/cording. I actually like it without. I did order myself a cording mini drill in my recent shop-fest (not yet received) so this project will offer an opportunity for a practise with the new tool. I also have never beaded the top of a tassel so that would be another new thing to learn. If you would like to see some other photos of this piece I have loaded them into a special set in my Flickr album. The fob is exquisite. I think it is almost the thing I like best about this project! Which is hilarious when you consider it is only the size of a fifty cent piece!! It’s going to be strange for me tomorrow, only two files from Martina to down load – Persian Iris Garden and Japanese Octagon box. Earlier this year I think I was up to 4 or 5! Crazy Cat Lady Exchange news! Oh bliss! 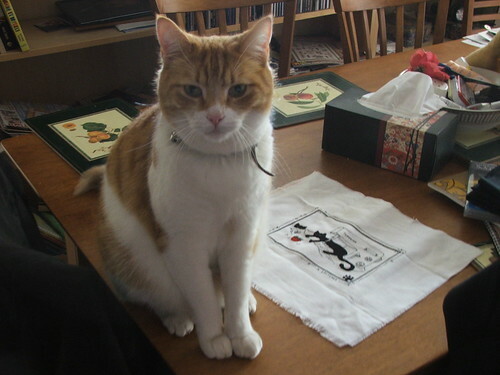 I finally heard today that the piece that I stitched for the Crazy Cat Lady Exchange arrived safely in Canada. I mailed it on 18th September, so you can see why I was getting a bit antsy. I chose to stitch “In Stitches” by Calico Crossroads for Beth. I ended up finishing it as a flatfold. Which is one of my favourite ways of finishing things. That’s a little mouse button in the corner securing the ribbon bow (I was pretty pleased with this button). I also included some charts I found at my LNS on sale (bargin!!) and some rather cute cat fabric that hopefully Beth can use for her own finishing projects. I’ve pretty much finished the Grape Threadkeeper, I just need to decide whether to do the tassel and cording. I’ve done a tassle with a brown thread but I don’t think it matches well (Joel disagrees) so I am waiting to see what I think in a couple of days time. In any case I will want to buy more thread in order to do the cording, there isn’t much left here. I’ll take some pics sometime tomorrow. 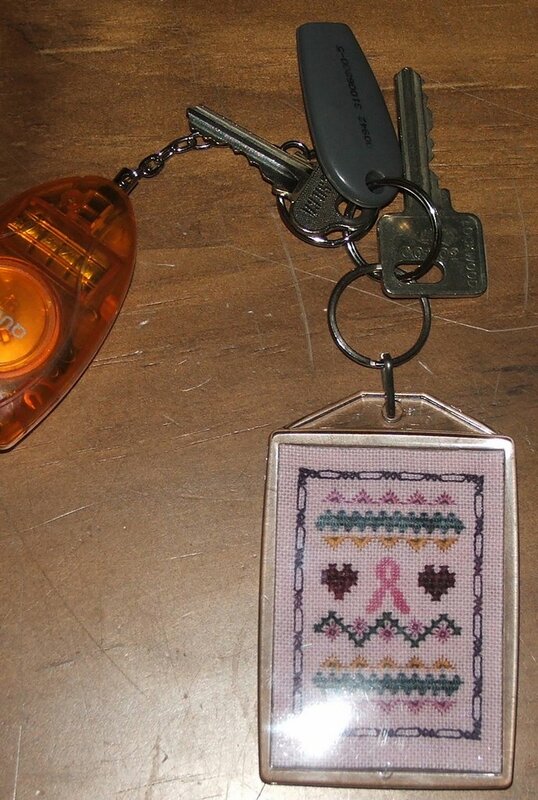 I loved this so much you can see I’ve already attached my work keys! I know I said I’d work diligently on Japanese Octagon Box but when I saw Cathy’s Essy’s finishes I just had to get one of my little Essy kits out to do too. I am just very easily influenced! That orange thing to the left is my personal alarm, just in case I am pestered in the library. I haven’t had to use it yet (Thank goodness). It was given to me on the first day of my new job, which was a little unnerving!! Update on the 10 project challenge. I just finished my 2nd project for the challenge! Of course I can’t show you yet – it’s an exchange piece again – the Autumn Quaker exchange for the SBEBB. I’m really pleased with how it turned out and have applied to join the Winter Quaker Exchange as well. I want to join in the Ornament exchange as well, so I am waiting Becky’s word that I can do both (we are supposed to only commit to one exchange at a time). I’ve adjusted my side bar and made room for my finishes for the challenge and also added the rules (as posted on the Needle and Thread BB) to keep me honest. I still have an outstanding order with Stitching bits and bobs (which I placed before starting the challenge). 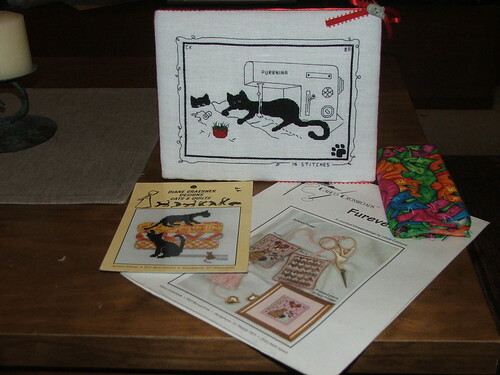 I am going to leave my FOTMs in place for the duration of the challenge – these include Vikki Clayton Silks, Little House Needleworks Thread packs and fabric from Country Stitch and Stitches and Spice. Other than the LHN none of these include charts anyway so are not in violation of the rules. Joel and I have made plans to visit Jackson’s Drawing and Art supplies on Monday to buy some mat board for the Grape threadkeeper project – this will probably be my third finish for the challenge – pretty exciting. For the rest of the weekend I plan to work on Japanese box, I’ve just downloaded another Brother Cadfael story by Ellis Peters (Monks Hood) from Audible which should keep me happy while I stitch though I suppose I should get Memoirs of a Geisha or some other story with a Japanese-y theme.